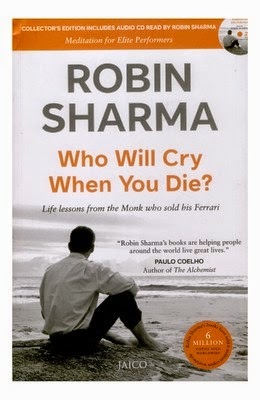 Who Will Cry When I Die, by Robin Sharma, is a collector’s edition that incudes audio CD read by the author himself. Who Will Cry When I Die humbly suggests 101 simple solutions to some of life’s most intricate questions and problems. It might be about dealing with stress and worry, or a prevailing way to relish the journey while creating a legacy that continues to nurture your dreams. Robin Sharma has come up with new ways of meditation that are practical and life-changing. The Meditation CD will aid you in surpassing your limitations and become the person you have always wanted to be. The Meditation for Elite Performers Audio CD is read by Robin Sharma himself. Robin Sharma is an esteemed author and lawyer. He was born in Canada in 1965 and completed his graduation in law and graduated from Dalhousie University School of Law. He is the Founder, CEO and the Chief Visionary Officer of the global consultancy firm called the Sharma Leadership International Inc. The consultancy’s clients include some of the most reputed companies such as GE, FedEx, Nike, Harvard Business School, and many other Fortune 500 companies. Robin Sharma was honoured with the Brand Laureate Brand Personality Award in the year 2009 and Golden Gavel Award in the year 2011. He frequently visits different countries as a motivational speaker. His books have been translated to more than seventy languages and are being sold in about sixty countries. Some of the famous books penned by Robin Sharma are The Leader Who Had No Title, Who Will Cry When You Die: Life Lessons From The Monk Who Sold His Ferrari, The Saint, The Surfer, And The CEO: A Remarkable Story About Living Your Heart's Desires, Megaliving!, Family Wisdom From The Monk Who Sold His Ferrari, and Discover Your Destiny With The Monk Who Sold His Ferrari.